It's about 7° outside today, and a dreary ice-cold rain has covered Kansai all day long like a wet, clammy blanket. 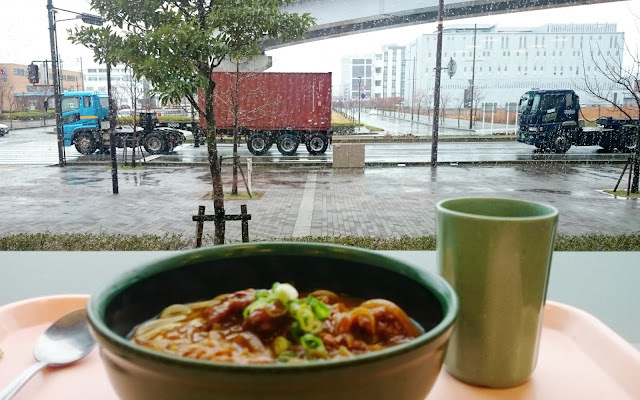 Curry-udon with fried chicken is perfect in depressing weather like this. Not the best for my body, perhaps, but great for my soul. But this is the last of winter. We had a short spell of spring weather already last weekend, and by next week temperatures will start rising. And you can smell spring approaching even in this rain. Winter will end in just a few weeks. And so will my job. For the past four years, I've been working in a team trying to model motor-related areas of the brain, and the muscles of the arm, in order to better understand the origin of motor symptoms of Parkinson's disease. The research project ends this month. I am unlikely to do another one. I was a programmer long before I started university. Graduate school was not meant to be a career change, but a rare opportunity to learn science. I took a short postdoc in Japan believing I'd return to Sweden and to software development afterwards. But I realized I wanted to stay here. As my contacts are all in research, and as my visa allowed me only research jobs, I ended up doing a series of research projects over the past dozen years. Last year I got turned down for a new research job, and I found myself relieved, not upset. I realized that what excites me is the people I work with and the technology we develop, rather than the research itself. I love science, but I don't have the temperament I'd need to love doing science. It's time to move on. I'm waiting to hear back about one rare and very exciting job opening. If that one falls through I'll start looking more widely in the Osaka area beginning next month. What will I do? I don't know. That's both a little scary and very exhilarating. Spring is coming.